We crossed watersheds today. The rivers now drain to the Pacific Ocean instead of the Arctic Ocean. I’m not certain of the exact location, and it wasn’t a dramatic pass but somewhere between 41km and 45km among several low hills. We had a good solid rain last night, but it was dry in the morning. The road has been rough and narrow but fortunately, not much traffic. It was flat terrain with an occasional low hill to climb as we followed the same broad valley. At 21km at top of the hill was the first cafe. It was still early, so I passed it by. 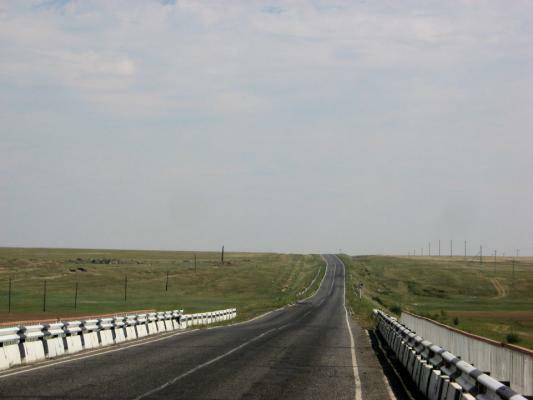 At 39km I came to Арей and after that some low hills as well as the continental divide. After 49km the valley opened up more and was without trees. At 52km a stop at a cafe in Новосалия. After our second breakfast, it became warmer and the valley more open. 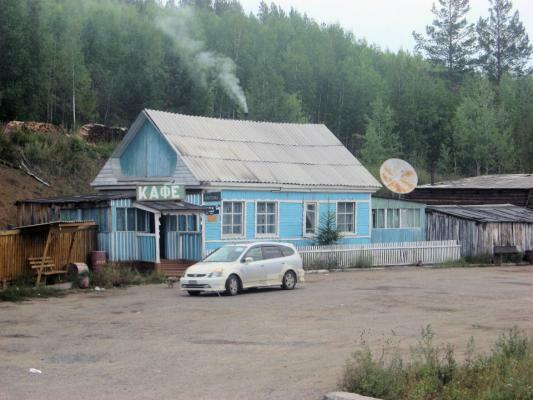 We passed Танга at 62km but didn’t see road-side businesses. 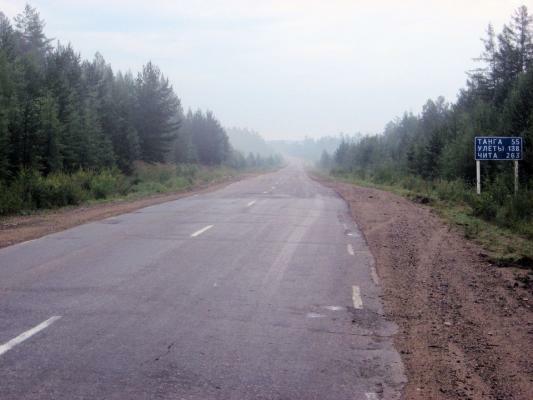 At 76km we decided to take the entrance into Николаевское and see if we could find a store. We saw three shops in town, but all were closed: two for lunch hour and one with a sign on the door. There were many houses but few people around town. We left at 83km without having found a place to buy food. The road went over a low hill from here. The valley was wide and open and it was dry. It reminded me of some grasslands in Eastern Colorado. We crossed one river and then descended into Горекацан. Fortunately, this town had both a cafe and store. There is a group cycling through from the Slavic Gospel Association. We haven’t seen them but suspect there was some mistaken identity in Горекацан. One patron in the cafe told Mickey he had seen us on TV. Another asked her if she was Polish. I had someone point to the heavens, look at me and say “Jesus”. After filling up at the store, we went to look for water. This was more difficult than normal. Two different people saw us and purposefully walked away. We decided to go up to a house and knock on the door. The dogs started barking, so people came to the side gate. When they saw us and bicycles, they said something in Russian along with body language of “go away!” This is different from the normal curious and friendly reaction. Fortunately, a car driver was able to tell us to look behind the cafe. We found a pump house here with two youths chilling a vodka bottle in the running water. We filled up on water and cycled up the hill to one of few groves of trees we found in the area.